Russia: The Russian Championship semifinal finished on September 22 in Saint Petersburg with Timur Sankin 6d (left) in first, Andrej Cheburakhov 5d in second, and Igor Nemlij 5d in third. Romania: Alin Badea 1d bested Sorin Sora 4d in the 4th Radu Baciu Grand Prix – stage 8 tournament in Craiova on September 15. Adrian Nedan 2k placed third. 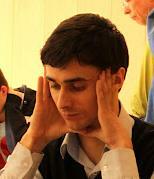 Poland: Also on September 22, Marcin Majka 3d won the Polish Championship Qualification in Lodz. In second was Sebastian Pawlaczyk 3d and Majus Misiak 2d came in third. 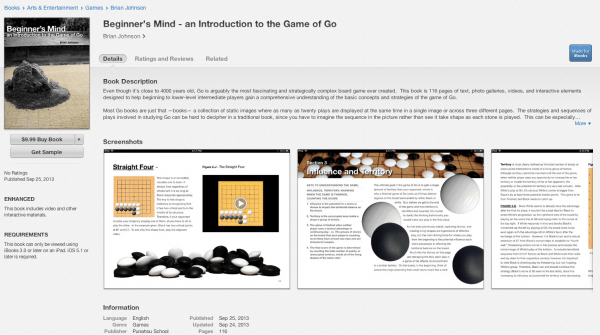 Honolulu Go Club member Brian Johnson has just published Beginner’s Mind: an Introduction to the Game of Go, an introductory go eBook. Johnson is a teacher at Punahou School who teaches a credit high school go course called “Buddhism and the Game of Go” and introduces around 150-200 students each year to the game. The ebook’s text is designed to take advantage of the touchscreen features of the iPad and contains numerous picture galleries, animations, and interactive elements to help explain and clarify basic and more advanced concepts of go strategy. Only available for the iPad, it’s $9.99 in the iTunes Store, where you can download a free sample. The entire Spring 2013 issue of Library Trends magazine is devoted to how to develop gaming programs in libraries. The authors agree that with libraries seeking a relevant connection to Internet-savvy young users, games can draw young people in. Various authors discuss the merits of video, tabletop, card, and role-playing formats. 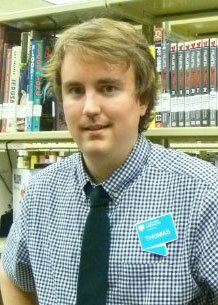 Among them is Thomas Maluck (right), a teen services librarian at Richland Library in Columbia, SC. In an article entitled “Play It Loud,” Maluck describes Go Your Own Way, a program he developed after seeing the AGF booth at the American Library Association convention in New Orleans in 2011. “Go encouraged positive parent-child communication,” he writes. “In one session, as a child learned the rules and played a practice game, his mother tried to kibitz over his shoulder. Her well-intentioned advice was based on a logical understanding of an aggressive, checkers-like strategy, but . . . the child’s understanding of the game was more advanced than his mother’s. Staff invited the mother to play and watched them both develop personal strategies and counterstrategies over the course of several games.” Although Library Trends is published by Johns Hopkins Press, it is not freely available. You’ll need access to Project MUSE; try your local public or university library. It’s an interesting issue. The go part of the 2013 SportAccord Mind Sport Online Tournament has just gone into the final stage. Over 1000 go players worldwide participated in the largest-ever online tournament. Three regional preliminary tournaments were held for Asia, Europe and Africa, and the Americas. The winners from four separate rank divisions in each region then participate in the finals. Many prizes are provided by Pandanet and by SportAccord, including tablet computers, digital cameras, etc. The top winner from the Open division will win an all-expense-paid trip to Beijing to observe the Third SportAccord World Mind Games held December 12-18 and to receive his trophy. In addition, all players who finished the preliminary round will be placed in a lottery pool for a grand prize of an iPad. The games are held on the Pandanet Internet Go Server (IGS). Click here for final schedule, client, and other details. “The AGA made my club possible 10-15 years ago,” responded on local go club organizer to a recent survey. “As long as I have a working memory, I will be grateful for this.” Said another, “People want to know why they should join the AGA. Usually the only reason they do is because they want to play in an AGA rated tournament.” Wondered another, “Can you provide any other reasons I or my club should rejoin the AGA outside of general support?” A whopping 85 club leaders across the United States responded to the survey last June, which queried them on club revenue sources, tournaments, meeting frequency, advertising methods, internal chapter email list maintenance, size and reach, and AGA membership. The AGA’s Board of Directors has been studying the survey responses and is “already using the results of the survey to plan additional chapter and member services” says survey organizer Greg Smith. “We did learn, however, that there are some misconceptions out there about the AGA and the services it provides. Many people made suggestions about what the AGA could do, when the AGA already does those things.” Smith credited Philip Waldron for establishing a valuable baseline in his “2008 Chapter Report” and Lisa Scott for collating the new survey’s responses. “We’ll both begin following up using the AGA Chapter List over the next few months, correcting the misconceptions there and in the E-Journal,” Smith said. Click here to see a detailed report on the survey. There’s still time to sign up for the next Pandanet-AGA City League. “We are looking for some more teams for this season to fill our roster,” reports Steve Colburn. “Talk to your club members and sign up now!” There are openings in all of the leagues; email the League TD Steve Colburn at steve.colburn@usgo.org. “We are also looking for League Managers as well,” says Colburn. Email Colburn for details. 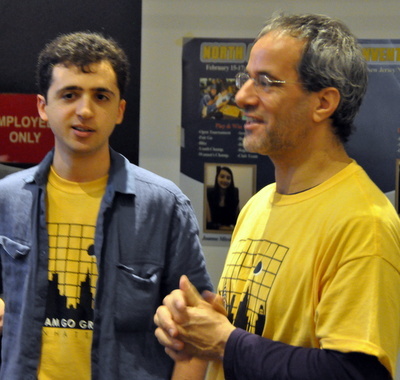 Gotham Go Group organizer Peter Armenia’s recent email to New York City go players was a model of efficient play, celebrating a club success, promoting an upcoming tournament and urging membership in the AGA. 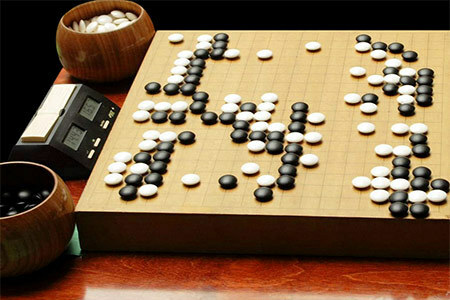 “Well it’s that time of year again,” Armenia reported in an email with the subject line “The Benefits of Membership.” “It was early October, 2011 that I put out the word that regular weekly Go would be returning to New York City. We have been going strong at the Hungarian Pastry Shop ever since, regularly getting between 12 and 20 players every week. On top of that: We had a very successful first Gotham Go Tournament last January with nearly 60 players; And another coming up in October! Click here to register; And the US Go Congress is coming to NYC next year! 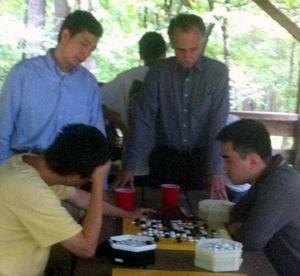 The Triangle Go Group hosted its 2013 tournament in an autumn outdoor setting at the Umstead State Park in Cary, North Carolina on Sept 21. Following tradition, the 30 participants were treated to a picnic lunch and all the entry fees were returned to the players as prize money. As dusk settled on the final game to be completed, Liqun Liu 7D topped perennial champion Changlong Wu 7D in a showdown for the Open Section championship. The A section (1D-2k) was swept by Seth Cardew, also with a perfect 4-0 record, with Brian Wu 3-1 placing second. In the B section (6-11k) Kerianne Squitire, Andrew Zhang, and Alvin Chen tied with scores of 3-1. Finally section C (14k+) was swept by Justin Zhang 4-0, with Colin Zhang, playing in his first tournament, finishing second with 3-1. – report/ photo by Charles Alden; photo: photo, tournament winner Liqun Liu (seated, right) faces Jeff Kuang in the third round as Eric Zhang and Frank Salantrie observe. 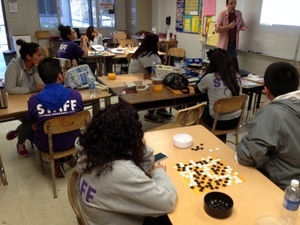 LA’s BEST, an award-winning after-school program serving 194 high-needs elementary schools in the Los Angeles Unified School District, has decided to establish a go teaching program in 12 schools, according to AGA President Andy Okun and LA’s BEST Director of Education Stela Oliveira. ”For those of us whose seen how captivating, fun and beneficial go is for little kids, this is an incredible chance to spread the benefits of the game and bring something new and exciting to a bunch of kids,” said Okun. The program started over the summer with a trial run at two schools, Latona Elementary School and Lareto Elementary School. Aside from providing equipment and sets of Hikaru no Go, the AGA and the AGF also provided teacher training led by former AGF teacher of the year Vincent Eisman. Eisman led a small teacher training in June and a larger one in late September. AGF will provide equipment, books and continuing support through the school year. To donate money to help AGF cover these training costs, as well as extra equipment like demo boards, click here to contribute. The fourth season of the online European Team Championship kicked off on September 17 with the first round in League C, followed by the first A-League round on September 24. This year 32 national teams — a record number – will compete, with Greece and Iceland entering for the first time in League C, which now comprises 12 teams. The British team hit the ground running on the 17th, with a 4-0 win over newcomers Greece, giving impetus to hopes of reversing last season’s demotion from the B-league (see EJ of 6/6). Click here to see British Go Association report, with game records. However, Switzerland (against Iceland) and Turkey (against Kazakhstan) also won all four games. Looking forward to the new season, European Go Federation President Martin Stiassny, predicted “a brilliant competition” in League A, with France new possible favorites for the championship as they field a very strong team comprising 2013 European Champion Fan Hui 8d on board one and Thomas Debarre 6d and Remi Campagnie 5d (currently studying go in Beijing) on boards two and three. This makes them now as strong as both Czechia, last year’s winners and Russia, who won the first two championships. Stiassny also marked out Romania, with Catalin Taranu 5p now on board one, as likely be stronger than last season, though in fact in Round One they lost 3-1 to the French. Ukraine, who beat Sweden 3-1 in the first round, will also be one to watch according to Stiassny. The Championship is sponsored by Pandanet and played with the new client GoPanda2 on IGS/Pandanet on Tuesdays, normally starting at 8p (time-zone UTC+1) in the EuropeanTeamChamp room. Click here for full results. – Report by Tony Collman, British correspondent for the EJ. Graphic courtesy Pandanet home page.